Minimum Age Requirement: The minimum age to rent this unit is 25 years old and guests must check in at our office with a photo ID. Parking: 1 car parking - This unit provides 1 car shared garage parking. Bedding: Blankets, mattress pads, bed spreads, pillows, sheets and towels are provided! Kitchen/Supplies: Our kitchens are supplied with all the basic dishes, utensils and cookware needed for everyday cooking. We also stock some cleaning supplies and dry goods such as paper towels, toilet paper, coffee filters, trash bags, foil, etc to help you begin your vacation however you will need to purchase and pay for additional supplies during your stay. You may want to bring: Beach chairs/equipment, blender and/or specialty cookware, laundry detergent, briquettes, extra place settings, extra beach towels, pens and paper, etc. No A/C - Please note this unit does not have air conditioning. The location is stunning! Right on the water, restaurants walkable, dolphins leaping in the air from our patio! Unfortunately the neighbors who seem to live there are not ideal. We have two young daughters and do not consider ourselves prudes, but their language was crazy inappropriate. And so was their music. It was very difficult for us to enjoy our patio time. So if you are young and single nothing to worry about. We could be wrong but based on what we heard it sounds like this house is owned by one of their parents so you will likely find them there again. Also, we knew we were paying for location, which is what we got. But the house is kind of gross. The furniture looks and smells like a thousand people have sat there. The kitchen was not great. And usually VRBO houses provide some EV00 or salt and pepper or something but not this one. It worked out OK though because we didn’t plan on spending a lot of time in the house, and the beach location was lovely. Great for kids. Perfect location. Did not want to leave. One week family vacation with two kids ages 2, and 3. Location is near a Market, stores, bars and great beach out front for all your beach activities. Bring or rent a bike. We did not want to leave. Spacious ocean front lower duplex unit located on the sand on the Balboa Paninsula in west Newport Beach. North of the Newport Pier on the narrowest part of the beach, there is no boardwalk in front of your unit just sand & ocean. 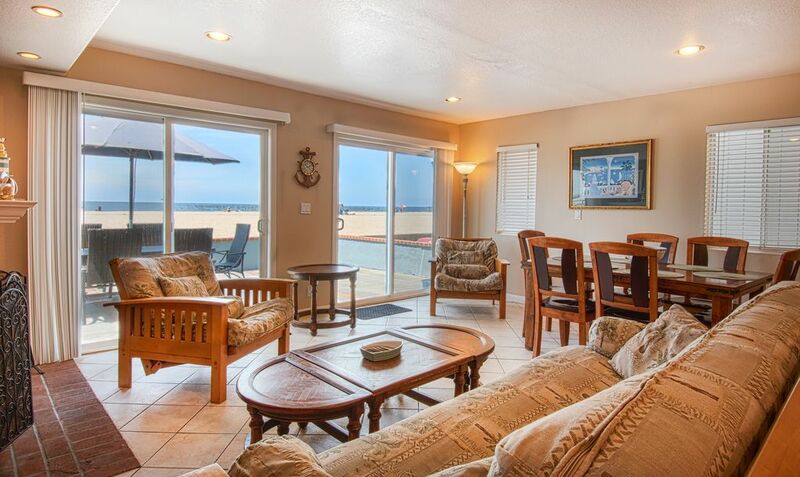 Enjoy the beach from your large lanai/patio, with endless ocean views, Catalina & beautiful sunsets. Close to the pier & restaurants, minutes away from shoping & John Wayne airport. About 30 minutes from Disneyland & Knotts Berry farm. Your whole family will enjoy their stay.